You probably found this blog post from social media or search. It’s a safe bet. As we become more accustomed to finding content from curated sources like search, social media, and email, we aren’t checking homepages as often. Rather than going to a news website, we count on finding something on Facebook, instead. And, if we’re on our phones, we may just be using apps that keep us inside the app – even as we bounce between different content. These trends are having a big impact on the average user experience. According to research from WIRED, just 32% of web traffic to publisher sites is direct traffic. 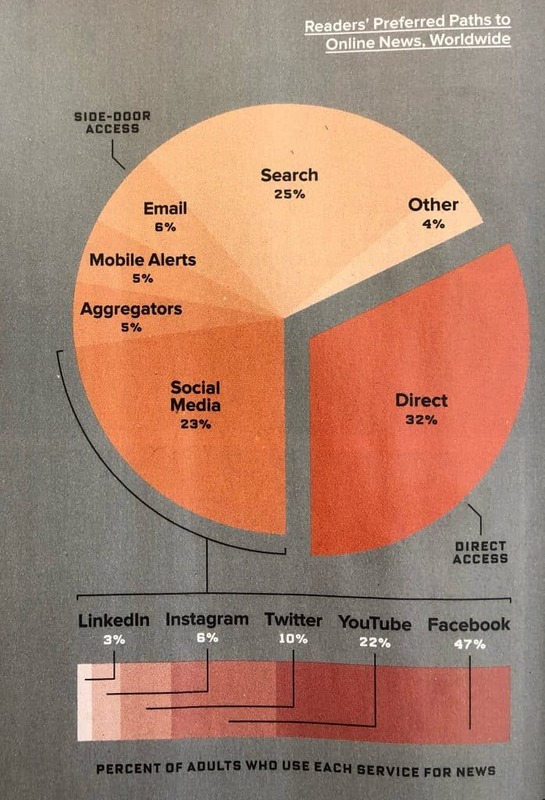 The biggest drivers of traffic after direct are search (25%) and social media (23%). Email, mobile alerts, and aggregators help complete the picture. All the tinkering and agonizing over an editorial layout actually doesn’t matter to the majority of web visitors. Because they never see it. Retailers should think about this trend, too – the homepage experience has to be applied to product page. With so much traffic coming from search, social, and email, a lot of your shoppers will never see the front page. So marketers need to do two things: optimize product pages and focus on re-re-engagement. If two-thirds of your shoppers won’t even interact with the homepage, you can start making different design decisions and optimizing the pages that are far more likely to be seen. All of this information has to be available on the product page itself. Display big, bold photos. Make sure there are reviews on the product page, for each product. If your shipping is free, highlight that message. Online chat can help answer any immediate questions and keep visitors engaged instead of bouncing. A survey from Idealo found that online chat had the highest level of service satisfaction – at 73% – when compared to email (61%) and phone (44%). You should conduct an audit of all your product pages and examine bounce rates. See what keeps your audience engaged and drives them deeper into your site. 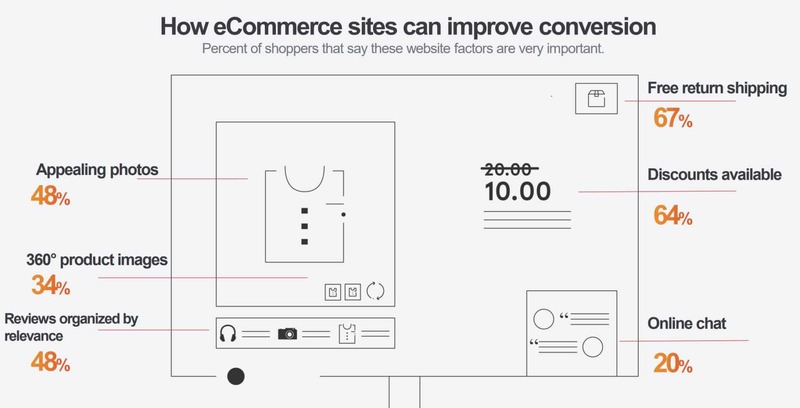 Make conversions as easy as possible. With so many visitors coming to your site from search and social, your sales become even more dependent on an effective product page. Research shows that the bounce rate for web visitors referred by social is 65% after the first page of a site, which means they’re not exploring further and they’re not converting. An Instagram post may interest someone, but once they click it, read about the product, and leave… they might not come back. As the browsing experience keeps getting more mobile and more curated,, we may see higher bounce rates and less brand loyalty. So how can you stay in touch? Email marketing is still one of the top tactics for retailers. But do you make it easy to sign up? Offer incentives to first-time visitors or subscribers and make sure the form lives not only the homepage, but across the product pages. Even if a shopper has bought something, that doesn’t mean you’ll see her again. In the deafening noise of offers and content, it’s hard to connect with people again. So make sure a loyalty program is always front and center – with the perks front and center, too. At Criteo, we’ve become hyper-focused on re-engagement. With Criteo Audience Match, we’ve built a product that allows you to upload your shopper data and then match it with the Criteo Shopper Graph, which allows you to tap 600TB of shopper data and achieve an average 60% match rate across all channels. At Criteo, we believe there’s no such thing as ecommerce or retail anymore, and instead, it’s about reaching customers at each stage of the shopper journey to acquire, convert, and re-engage them. When it comes to re-engaging your audience, you can use Criteo Audience Match in order to match your CRM data with Criteo’s Shopper Graph. That way, you can connect with your shoppers across all your channels and display them the most relevant ads along each touchpoint. With Criteo’s Shopper Graph technology, you can guarantee that the ads are hyper-personalized to recent purchase history and preferences, too. As the homepage becomes an incidental destination rather than a deliberate one, retailers and brands will have to figure out new ways of getting shoppers to visit the site – or just checking out at each individual touchpoint instead.